How to make changes to the existing PAN card? Correction or changes to Permanent Account Number or PAN details are done only when any data relevant to the PAN card such as applicant’s name, father’s name, birth date, address etc required to be changed and updated with the income tax department’s records. You can obtain a PAN change request form from any TIN Facilitation center or online from NSDL Site or UTI Site. After getting the form from any of these sources you need to fill it out with all the details and tick the appropriate place which you want to change. If you want to use online facility to change PAN details then payment can be done through credit card or net banking facility or else you need to pay cash in any of the TIN facilitation center operated by NSDL in India. 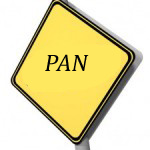 Though the changes to PAN card details do not result in the change in Permanent Account Number, the relevant information is updated, and a new PAN card with the old Permanent Account Number is issued to the applicant. For instance, if your PAN is ASJKP1254X then the number ASJKP1254X will remain and the details like address, name and other details that you have changed will get changed in income tax database. The new card that you receive from department will be having ASJKP1254X as your permanent account number. If you want to apply online then you need to visit this links Or you can visit any of the TIN Facilitation center nearer to your place and file a PAN correction form for getting the details corrected in your PAN Card record. Married ladies – change of name on account of marriage Marriage certificate or marriage invitation card or publication of name change in official gazette or copy of passport showing husband’s name A certificate issued by a gazetted officer. Individuals Relevant proof of identity having correct date of birth. Non Individuals Relevant proof of identity having correct date of incorporation.